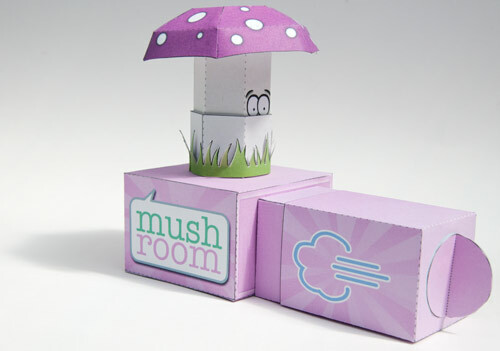 Mushroom Model - Pneumatic pmechanism! Come and get it! 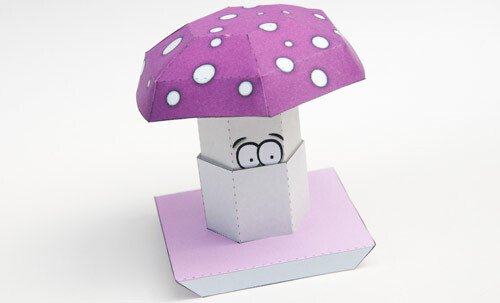 Mushroom is a paper animation model for you to download, print out and make. 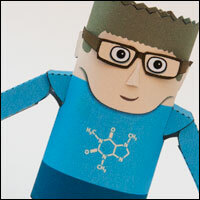 As a member, you can download the parts file at the end of this blog post. None members can download the file for a nominal fee. 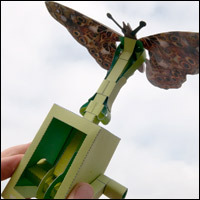 Download the model and lets get started making this fun and quirky model. There are two version of the project in the downloadable file, colour and mono, pick the version to fit your needs. 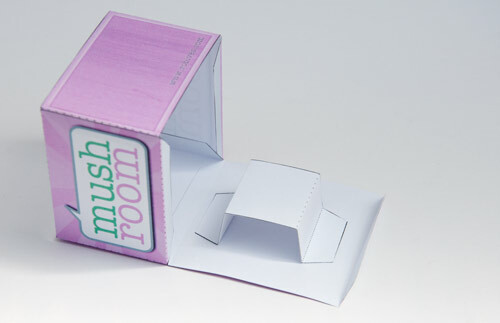 Print out the three parts pages onto thin card. 230 micron board is perfect for the job. 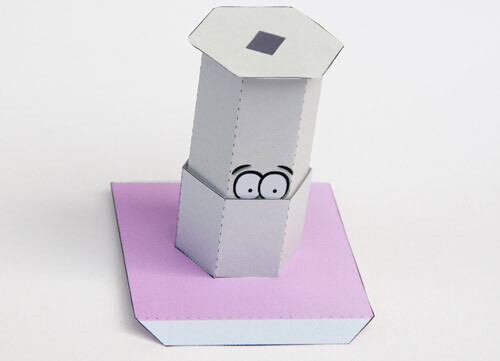 You’ll need a few basic tools to make this model. Scissors, ruler, a sharp knife, some PVA glue and a glue spreader. 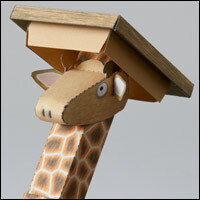 Carefully score along all the dotted lines and cut out any holes before you cut out the parts form the sheet. Both these jobs are easier on a whole sheet. Cut and score as accurately as possible for best possible results. 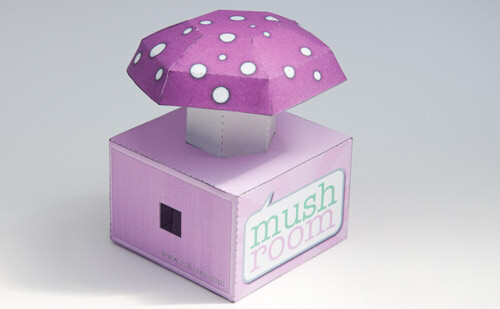 Fold up and glue the mushroom cap. Set it to one side as the glue dries. Fold round and glue the stalk tube. Make sure that you line the ends up accurately so that there is no twist in the tube. Fit the stalk tube into the box top and glue it into place. Fold round and glue together the stalk. Thread the stalk into the stalk tube. Glue the stalk base into place on the end of the stalk as shown in the picture. Flip the stalk over and glue the stalk top into place as shown. 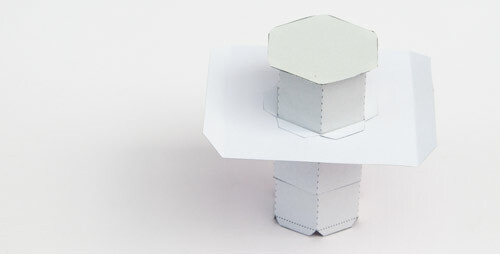 Assemble the cap stand as shown above. Thread the cap stand down through the hole in the top of the stalk, glue the three flaps down. Glue the grey area on the cap support to the cap stand. Let the glue dry thoroughly. Apply a thin strip of glue to the cap support in the three areas arrowed above. Fit the cap to the cap support. Line up the ends with the crease lines on the cap where the arrows point. Let the glue dry thoroughly. The mushroom should be free to move up and down. Glue the two box sides together. Glue the spacer to the box base as shown above. Glue the base to the box sides. 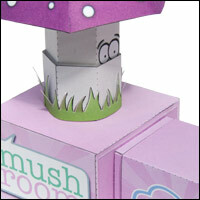 Glue the box top with the mushroom into place on the top of the box. Assemble the two parts of the piston. Glue the piston onto the side of the box as shown. 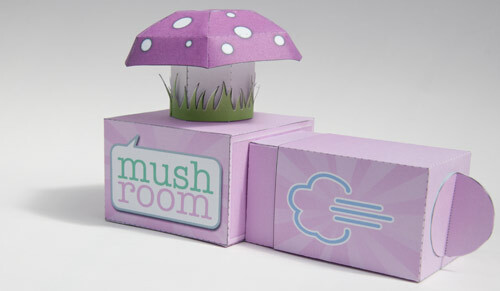 Pump the piston and the mushroom will pop out of the box! have you ever considered incorporating the pneumatic device with say, a rack-and-pinion? couldn't this device be used as a negative-pressure device as well? i LOVE all the stuff you're doing here.. i just finished building projects from your book Gizmos.. i must say that i enjoyed the experience.. its inspired me to think about all kinds of mechanics and their possibilities.. Brilliant! 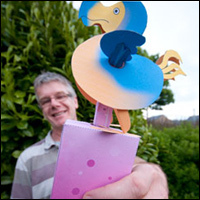 This model is another Rob Ives CLASSIC! I love the new subscription offerings. Are you planning on sending out emails when our membership is coming to an end so that we can Re-subscribe to keep the fun stuff coming!?! Don't worry, I'll keep you informed if your subscription is coming up.